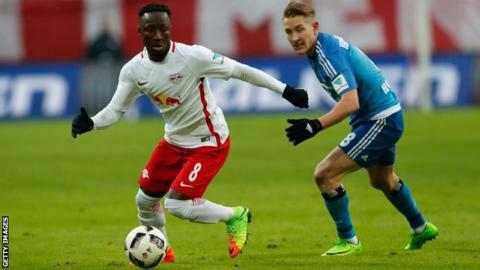 Leipzig insist the 22-year-old Guinea international will not be sold this summer after they qualified for this season's Champions League. Keita has been touted as having a £70m price tag, although he has a £48m release clause in his contract that can be unlocked next summer. Liverpool are yet to bid for Keita, who scored eight league goals last season. However, manager Jurgen Klopp is a huge admirer and the Anfield hierarchy look certain to test Leipzig's determination to keep someone who has been a central figure in their success with a firm offer. It also remains to be seen whether Keita himself is attracted by a move to the Premier League. If Klopp, who returns to the club's Melwood training headquarters to start pre-season preparations next week, and Liverpool do make their interest concrete, the fee involved will have to be well in excess of the £34m (39 euros) recently paid to Roma for Mohamed Salah and the £35m it took to sign Andy Carroll from Newcastle United in January 2011. Liverpool's owner Fenway Sports Group is determined to back Klopp in the market after he took them back into the Champions League - although they have to get past a play-off first.